In other words, it’s procedure time. There are moments when Action Figure Pete needs a helping hand when his two are not enough. So I pulled on my big girl boots and faced the situation. Align the mixer chute so that the corn flows into the properly assigned bin. Tractor, check. Mixer, check. Farmer, missing. What am I doing here? Once AF Pete was present and accounted for, and in the proper tractor driving position, I assumed my designated stance at window number #4, also known as window #5. Window #4 and #5. When did we start assigning numbers to windows and why wasn’t I told? And why two numbers for one mere window? And why don’t I get a number? I’ll give myself a number. I’m #1! Unless there’s a window called #1, then that can get confusing. Back to it, my job today was to help guide the chute into window 4 or 5. Whatever it calls itself. All this while Action Figure Pete very slowly backs up the tractor/mixer to the window. Which puts me in a bit of a precarious position. I find myself between the proverbial rock and a hard place. I am standing in a puddle of poo between tractor wheels and fence. I’m very mindful of the fact that should the tractor slip and slide, my exit options are few, and boot traction is minimal. So there are a few tense moments making this not one of my favorite procedures. Thankfully, the chute easily aligns after a little bit of manuevering and down spills the corn into its storage facility. Oh, this is where the mystery of two numbers for one window are solved. Inside, there are two separate bins beneath that window. One to the right and one to the left. Thank god for reason. Once again this brings home to me how one farmer’s day-to-day activities are much more trickier than my average day at work sitting in front of a computer. What with the season of ice and snow upon us, I just want to say, stay safe to all of you farmers and your families. Rain, shine or snow, out the door they go! Your photos would make a great calendar! Thanks Roy! If I ever make one, I’ll have to send one to you! Love your curved-roofed barn 🙂 Yes, stay safe!! I love going up in that hay loft, it’s amazing inside. I could almost live up there! So, the number doesn’t necessarily correspond to the window per-se, but the bin located inside the window? Exactly, once inside one would see two different bins under that window. You’re hired!! Whitewashed, glass-tiled, cool in the summer, cold in the winter. 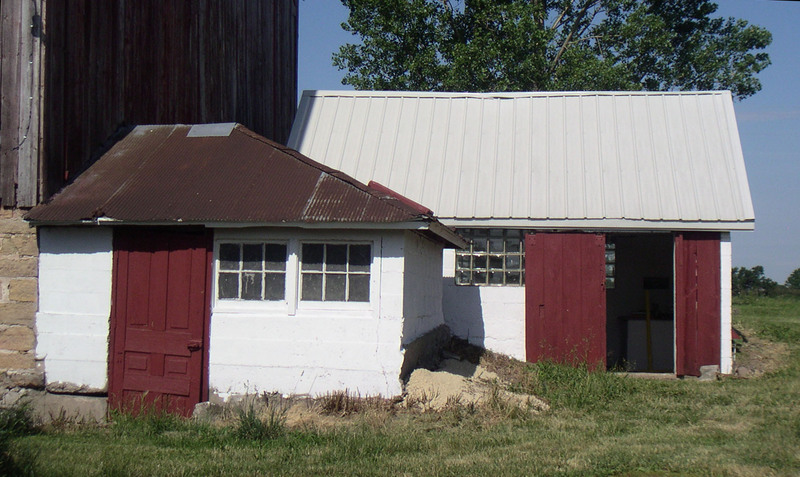 That is the milkhouse that has become my studio where I hope to get back to my basic roots of drawing, painting, and at some point, printmaking. And just in case you think this is all about my artwork, I'll be posting about daily life on a small, working farm as well. And since I didn't grow up on a farm, and have no idea what to do in many cases, you may find a few amusing anecdotes as I grow accustomed to life here. This will be an evolving, and in all probability, ever-changing site as I figure things out. So stick around and let's see what happens! Steam & Gas Show…it’s a gas!